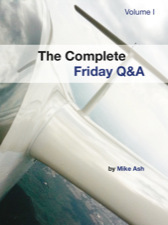 The Complete Friday Q&A is a collection of articles on advanced topics in Mac OS X and iOS programming. With articles on memory management, performance tuning, Objective-C, system internals, and more, this book is your gateway to becoming fluent in complicated, obscure, and arcane corners of Mac and iOS programming. Here, you can purchase electronic copies of these books directly from me, the author. 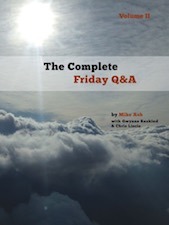 Each purchase comes with DRM-free ePub and PDF versions of the book. Buy two or three volumes at once and get $10 off the second and third volumes. The original! Volume I contains all articles from December 2008 to August 2010. Buy two volumes, get $10 off! Buy three volumes, get $20 off! The sequel! Released in 2017, Volume II contains all articles from November 2010 to November 2012. The other sequel! Volume II got too fat, so I split it in half and made a Volume III. This one contains all articles from December 2012 to April 2016.